CineVegas President Robin Greenspun, right, presents an oversized check to the founders of Not On Our Watch during the CineVegas film festival opening night premiere of "Ocean's Thirteen" on June 6 at the Palms Casino Resort in Las Vegas. 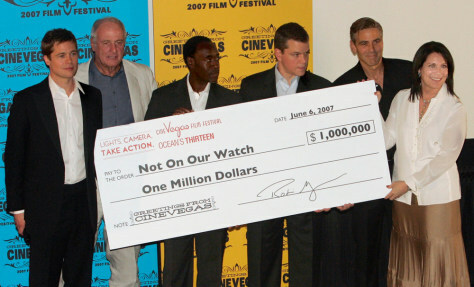 From left are Brad Pitt, producer Jerry Weintraub, Don Cheadle, Matt Damon and George Clooney. The premiere was a benefit for Not On Our Watch, an organization providing humanitarian relief for uprooted people in the Darfur region of Sudan.